Kathmandu valley, which is situated at an altitude of 1336MTR above the sea level and covers an area of 218 Sq. miles, is the political, commercial and cultural hub of the Kingdom. The city is famous for its Archeological and historical sites. Once a separate kingdom in itself, it contains four major fabled cities, Kathmandu, Patan, Bhaktapur and Kiritipur. The skillfully built temples and palaces, delicately- engraved stones and metal images, carved wooden columns and pillars and the history laden shrines and Chaityas (stupas) of these four historical citiesstand as paradigm of the artistic achievements. The valley is rich in places of both Hindu and Buddhist pilgrimage. These two religions have been quite brotherly residing within the kingdom since time immemorial. It is the historic seat of Royal family. The Durbar square, with its old temples, and places, epitomizes the religious and Cultural life of the people. The kings of Nepal are crowned and their Coronations solemnized interesting things to see here are; Talaju Temple, Kal bahairab Temple, The god of destruction, Nautale Durbar, Coronation nasal chowk the Gaddi Bautak, Jaganath Temple, and status of kings. Duly recognized as a world heritage site by UNESCO. This is one of the world most glorious Buddhist Stupa, it said to be 2000 years old. Visitor often calls it monkey Temple. The main structure of Stupa is brick and clay which supports a lofty conical soiree capped by a pinnacle of copper gilt. There are all seeing eyes of Lord Buddha on the four side of spire. Being situated 177m above the level of valley the hill of shyambhu nath is a mosaic of small stupas and pagoda Temples. This temple of the goddess believes to be famous in the way of tantric. Other Temples and Tibetan monasteries surround the main stupa of lord Buddha and temples of goddess. From this stupa one can view entire valley of kathmandu. This stupa listed in world heritage site by UNESCO. One of the oldest and biggest Buddhist monuments ever built in Nepal. 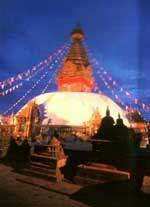 Boudhanath is an imposing structure standing. The stupa stands on the massive three level mandala styled platform surrounded by colorful private family houses. Stupa is said to have been built in 5th Century A.D. The site is considered very much like Mecca for the Tibetan Buddhist. This temple is being the Lord Shiva. The temple possesses its two- tiered golden roof and silver doors and is famous for its superb architecture. It is situated near by Airport on the banks of Bagmati River. Being one of the most important Hindus Temple, it is center of annual pilgrimage on the day of "Maha shivaratri. From time immortal, the temple area has contained numerous temples, stupas, Monasteries, images and inscriptions. Not only is the Pashupati area, a pilgrimage site for the Hindus it is also an important culture treasury for the entire world. Located nearby the Temple of Kumari, this is a unique type of wooden temple also known as Maru Satal. It was built in 1596 A.D. by King Laxmi Narsingh Malla. They say the timber used for its relevant construction was sawed out of a single tree. It is also believed that the capital of Kathmandu derived its new name from this very 'Kastha Mandap.' Today it houses the Hindu God namely Gorakh-Nath. This falls to be the historic seat of the past royalty, particularly belonging to the Malla dynasty. The Durbar Square, which is itself the old Royal Palace Complex dedicated to the Malla monarchs, is today classified as a World Heritage Site of Culture. The age-old temples and palaces epitomize the religious and cultural life-style of the people. The interesting things to view include Taleju Temple built by late King Mahendra Malla in 1549 A.D., a gigantic stone figure exposing the fearful manifestation of the Black Vairab which the Hindus regard as the God of Destruction, the tall stone pillar on the plinth-top of which sits late King Pratap Malla with his two beloved queens on either sides plus an infant child in the middle, the colossal image of the White Vairab the lattice of which is removed for a week during the Kumari Yatra festival, the nine-storied Basantapur Palace (literally meaning the spring season palace), the Gigantic Bell and the Great Drums. The main golden-gate is guarded by the Monkey-God called Hanuman . He is the King of the Monkeys and a faithful servant to Lord Ram Chandra-the unanimous Hero of the ancient epic "Ramayan." Being guarded by a sole protector, the gate itself has come to be known as Hanuman Gate. With a commercial umbrella suspended above his head and wrapped in a scarlet cloak, he squats on a stone plinth to be respected by hundreds of Nepalese Hindus plus Indian Hindus. (He is actually blind-folded as he was a chaste bachelor and wishes not to come in vision of any female figures). The temple and the holy quadrangle with a Buddhist stupa at the center form the residential quarters of the Chaste Virgin Living Goddess called KUMARI. The traditional building has profusely carved wooden balconies and window screens. The non-Buddhist and the non-Hindu visitors may enter the courtyard called the 'bahal' but may not proceed beyond upstairs. The KUMARI acknowledges their greetings from the central window of the balcony particularly saved for Her alone and snapshot is strictly prohibited. About 8 km north of Kathmandu, at the vase of Shivapuri hill is a remarkable colossal status of Lord Vishnu, reclining on bed of snakes. This is one of the masterpieces of stone sculptures of the Lichchhavi period. This fifth century statue is in the middle of a small pond and seems to float in water. Sankhu an ancient town is a little north east of Kathmandu. It was once a trade route to Tibet. One can see here the medieval rest houses of rich traders, shelter of porters, horses, stables and variety of houses. There are houses adorned with Greek columns of various designs, like Corinthian, Doric and Ionic houses built after the middle of 19th century, decorated with celestial mumps or cupid with his bow and arrow. The Vatrayogini temples, which sit in, the middle of a hill surrounded by green forests. Many rock and caves exist for Buddhist mediators. Some of them were cared in monolithic rock, from as far back as the beginning of the Christian era. Dakshinkali is a tantric goddess worshiped by Hindus all over the world. The Buddhist and other Nepalese equally venerate her. The Kali cut developed after worship of fertility cult all over the world. Because of the Tantric influence, she is represented a Skeleton without flesh and blood, very symbolic. She represents the eternal time and lives next to the cremation ground. Near Dakshinkali one can visit ancient Pharping village offers many arts objects. It is believed that Padmasamba, the founder of Lamaistic School of Buddhism in Tibet. There is Guru Rinpoche's cave where on can see Guru Rinpoche's residence and reminder such as hand print, foot print Head print and other parts of the body. Every day many Buddhist Pilgrimage visit there. Many Buddhist Monasteries are built around there. Chovar is famous of its gorge. Ascending two minutes reach of the Adinath temple, full of pots and pans offered, it is strange to see the entire temple is covered with Brass pot.